Picture perfect for this picnic. Wish I could have sat down and joined in. So many people enjoying themselves, whether they were sitting down and drinking or just walking on by. The empty bottles are lined up, the drawings left behind. These guys are probably restocking and will be back soon. Cameras out in force to document the great scene for many. Lots of happy hanami revelers. Most people who drink too much seem to fall asleep. Plenty of blue tarpaulin laid out for the lucky ones who have reserved their spot. Rilakkuma slippers waiting for their owners to claim the space. Somebody get that dog a beer ! So many different groups of people coming together to watch the sakura. The sakura trees seem to come together to form a sea of cherry blossoms. The crowds always come to Ueno Park to see the sakura at this time of year. On a fine, day like today, it can be very busy. Local Shrine with some nice red color. As at any good matsuri, there is always plenty to eat. Anyone for a flame warmed dango? A mixture of many things. That bowl looks like it is ready for a clean. Tasty corn ready to go. Any takers? These looked really tasty. I realized after I took the photo that the pepper is just coming out of the container and hitting the meat. Lots of heads bobbing along the road. Is that a tent off to the right? The old style buildings in the background blend in nicely with the park scene. Not the best lens for a closeup shot, but worth a go with some added bokeh. Is that a green dinosaur hanging out with Rilakkuma? People everywhere. It was hard to focus on watching the sakura with so many people around. Bright colored plastic lanterns help to mix up the color. One of the many temple structures in the area. People working their way through the crowds to get a photo. Lucky most people are using digital cameras, although I bet Kodak and Fuji are missing the good old analog print days. Convergence of trees brings the pink sakura to a peak here. Lanterns lit in the afternoon. Great atmosphere. Not sure what this structures official name is. Anyone know? The shade takes the color away from the trees a bit, but the mass of sakura still makes an impact. Food deliveries were being made by stores. I think this guy might have got lost. More happy scenes from hanami watchers. Looks like a game of cards being enjoyed here. Food, friends and drink. Great combination. Everyone working their angles to get the best shot from the lower hanging branches of the tree. very nice set of photos. i was there this afternoon, it was very cold and grey. was it warmer this morning or did you enhance the colour ? Beautiful! Is there a lot of trash left over from all those outdoor picnics? There is, but at Ueno Park they have large bins to collect and keep the place clean. I’ve been following your site for a few months now and after seeing the awesome pictures that you took this time, I cannot bear not commenting on your posts anymore. Thank you so much for sharing your pictures with us. I really miss Japan and hope that I can go there again in the near future. I was going to go out to Meguro River tonight, but it was much colder than yesterday and I didnt go. Maybe one day this week I will try some night shots before the weather changes and the sakura disappear for another year. I don’t know if anyone has answered this already or not, but I am pretty sure that #30, the structure is called a stupa. Traditionally, stupas were just small mounds of dirt or stones that had buddhist relics or even siddhartha’s bones buried underneath them. This one looks to be a slightly more elaborate one. Awesome photos, and lucky with such weather! It’s been raining off and on here, and the temperature has taken quite a dip today. I now know what dango is. I Googled it. A dumpling usually served w/green tea. I’ll take one to go w/extra butter. Now that’s the true meaning of camping out. 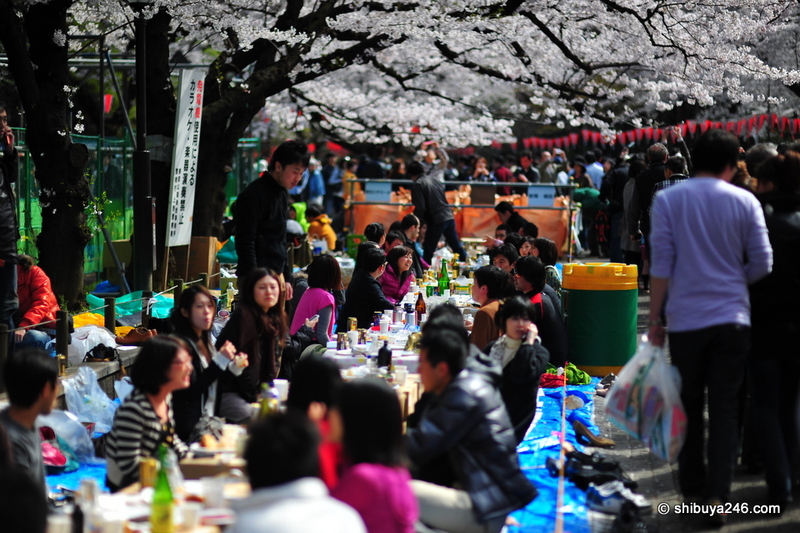 http://bit.ly/8ZAeN5 All the Sakura,people food drinks and a great time to be had.Lovely photos. Can’t seem to get enough of them. Keep em comimg. i just found out today that the cherry blossum trees they have in Washington,DC were sent there by Japan to show their friendship w/the US. that’s why you see so many friends at these gatherings. warning, not the designated driver . . .
need to make “haute couture” version of these . . .
Really beautiful photos. I’ve seen sakura in Japan before (including in Ueno Park, actually!) but never in full bloom like this. Would love to come to a proper hanami one day. Great photos! Brings back good memories. I went out to Ueno Park today to see the Sakura. I have been there for ohanami with my friends…. Amazing photos , it really capture the essence of the festival. What time of year is the best to visit the festival? Wow! all of those photos are awesome! Love this place and the people around. The destination I could not forget in my life.